Tiger Global-backed startup BlackBuck, run by Zinka Logistics Solutions Pvt. Ltd, is scouting for acquisitions to bolster its play in the competitive logistics sector. It is looking at a couple of acquisitions to power up its tech infrastructure, said Rajesh Yabaji, founder and CEO, Blackbuck. "We are evaluating two to three companies in the field of Internet of Things and product optimisation," Yabaji told Techcircle.in. Meanwhile, Saikiran Krishnamurthy, the newly appointed CEO of Flipkart's logistics arm eKart, has joined the board of BlackBuck. Flipkart is also an investor in the business-to-business logistics startup, and has a decent stake in it. Yabaji, however, said there has been no fresh investment by Flipkart along with Krishnamurthy's entry and called it a "mentoring sort of appointment". He said Krishnamurthy had come in as a mentor to bolster BlackBuck's efforts in exploring what more it can do in the particular logistics category that it operates in. "Flipkart wants to radically transform the entire logistics play in the e-commerce space. We do not do e-commerce and Flipkart is not a client," Yabaji said. "We see Krishnamurthy's arrival on board as a strategic, long-term partnership to crack the logistics sector." Krishnamurthy was the COO of Flipkart's commerce platform before being made the CEO of eKart. According to Yabaji, in the long term, BlackBuck would look to build products which both the companies could use and would see if it "could leverage some of the tech products that Flipkart has build in the logistics space". BlackBuck was founded in April last year by IIT Kharagpur alumni Yabaji, Chanakya Hridaya and Ramasubramaniam B. It has secured $30 million so far in two rounds of fundraising from Tiger Global, Russian billionaire-investor Yuri Milner's Apoletto fund, Accel Partners and Flipkart. At the time of the last funding round, Flipkart co-founder Binny Bansal had said that BlackBuck brings in new tech capabilities that would strengthen Flipkart's supply chain. The Bangalore-based firm has made a series of top-level management hires recently, the latest being the appointment of Shilpi Pandey as head of human resources. In her most recent role, she was the vice president â€“ HR at CommonFloor and had worked with Infosys, Wipro and Aditya Birla Group in the past. Indraneel Bommisetty was appointed as head of products and data sciences recently. An IIT Kharagpur graduate, he founded an ed-tech startup called Divi about three years back. It also hired Viswanathan Thiagarajan as head of engineering. Prior to joining BlackBuck, he was the senior director engineering at Rovi Corporation. He has also worked with a number of startups including Winphoria Networks and Veveo in. The startup has a 1000-member team, of which 350 are on its payroll and the rest are contract employees. Blackbuck is a marketplace for inter-city freight services in the long haul, full truckload and standard (goods, temperature and delivery time) delivery category. Nearly 95% of road freight is inter-city services and the rest is shared between intra-city and hyperlocal businesses in India. Blackbuck doesn't do part truck load, it rather solves the business of getting the truck effectively. It works with more than 150 customers, serving 200 locations across the country with about 30,000 trucks on the platform. Yabaji claimed the company is growing 2X every month and will become the largest player in the segment it operates in (full truck load business) in the next quarter. Blackbuck takes 10-15% commission on every deal. "From a unit price point of view, we do not have a huge price difference from the offline business. Our focus is price discovery," said Ramasubramaniam B, co-founder and chief strategy officer, BlackBuck. A bunch of startups has mushroomed in the logistics space over the last couple of years and early signals of consolidation are already visible in the sector. Truck aggregator Moovo.in recently acquired Patna-based GoGoods Pvt. Ltd, a similar venture which aggregates trucks for intracity transport in Patna and Ranchi, in an all-stock deal. Last year, Bangalore-based tech startup Diptab Ventures Pvt. 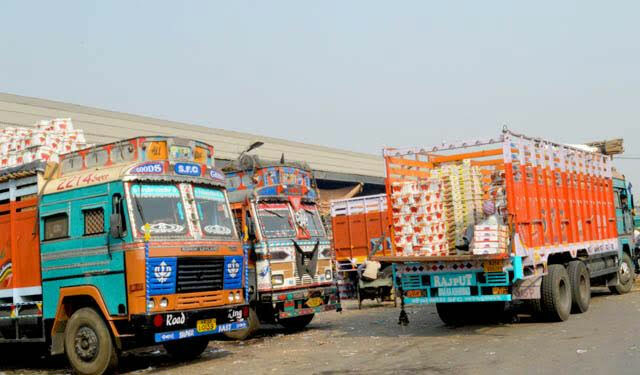 Ltd, which runs a marketplace connecting users to last-mile logistics service providers for intra-city deliveries LetsTransport.in, had acquired Shifter, a similar venture which connects mini-truck owners, for an undisclosed amount. Earlier this month, logistics management platform Locus, had raised $2.75 million in a Series A funding round led by Exfinity Venture Partners. In February, Pune-based e-commerce logistics firm Xpressbees had raised about $12.5 million in funding from existing investors SAIF Partners, IDG Ventures India, NEA, Vertex Ventures and Valiant Capital. In the same month, Mumbai-based Craftsvilla had acquired on-demand logistics enabler Sendd for $5 million, in a bid to strengthen its logistics capabilities. In October last year, Bangalore-based hyperlocal delivery startup Opinio had raised $7 million in a Series A funding round led by e-commerce logistics firm Delhivery.